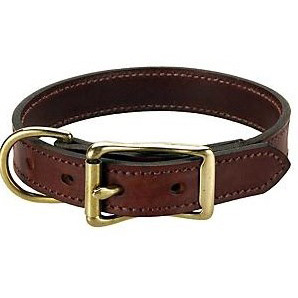 Mendota Leather Dog Collars, all leather collars have a fully stitched design, that softens & improves with age, and comes in a delightful Chestnut color. The Standard Flat Leather Collars, any dog will wear this collar with pride. Beautifully hand crafted and extremely durable. The Rolled Standard Collar has the same durability and regal look of our other leather collars, along with a little extra comfort for our long-haired dog friends.